Q: How do I join the Future Imperfect? A: Fill out the form on the Join us page, and we’ll contact you with more information!Q: How much are dues for Future Imperfect Membership? A: They are exactly $0.00 – Nope that’s not a typo, there are no dues. There are dues if you would like to become a member of STARFLEET, The International Star Trek Fan Association, Inc. – which is highly suggested since they have a lot of neat programs to offer. Q: When/where are the meetings? A: Meeting times and locations are posted on the Calendar page of this site. Q: I just joined the Future Imperfect. Where do I get more information about the club and my status? A: You will be emailed a membership packet with more info if you didn’t already get it from an Officer. Q: How do I get promoted? A: Show up to meetings, activities, and other functions – you even get promotion points for stuff that you do with other STARFLEET chapters within our Region. You can also donate your time, money, clothes, or other materials to charitable 501(c) organizations and you’ll get points (even if you claim it for a tax break)! Q: How do I become a Commissioned Officer? A: Take and pass OTS, OCC, and SOO (you also must be a member in good standing with STARFLEET). Contact the Operations Manager or Chief Medical Officer for information about classes and further details. Q: I work a lot of hours, so am I required to attend every Future Imperfect function? A: Nope – to maintain active status you must attend 10% of the functions throughout the year. 10% is about three activities/meetings per year. Senior Officers do have some more strict requirements however. Q: I have a great idea that I think we should try… Who do I tell? A: Bring it up at a meeting, ask one of the Commissioned Officers or your Department Head to bring it up at a meeting. You can also Contact us! 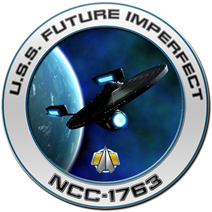 Q: Can I be a member of the Future Imperfect (Commissioned or Non-Commissioned) if I’m a primary member of another STARFLEET Chapter? A: Absolutely! Just include your SCC number in the email, and we’ll sign you up as an “Associate Member”. Q: I’m a member of another STARFLEET Chapter. I just applied for (associate) Future Imperfect membership, what is my rank? A: Your current rank in STARFLEET, will also apply while you are an Associate Member of the Future Imperfect. Q: Where can I ask a question that isn’t posted here?